Many buildings are built on shallow foundations. Grade beams, footers, and some columns are examples of shallow foundations. These work well if the soil has sufficient bearing strength to support the building loads. 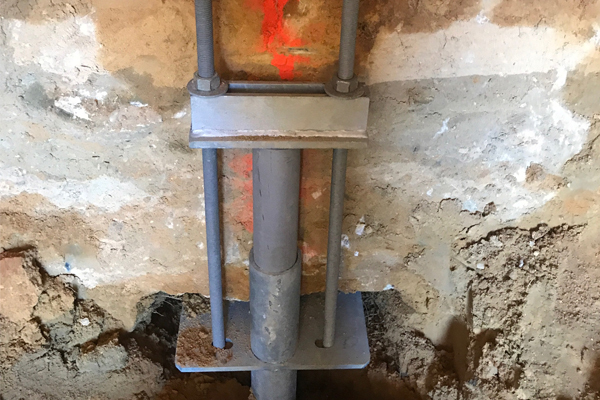 If a building is constructed on poor bearing soils, helical piers are a non-intrusive fix to arrest foundation settlement. Click here to see examples of underpinning projects that we have completed for our clients. Some helical pier installations pose extremely limited access and major mobilization issues. Inside work, such as basements or crawl spaces, are examples of these types of challenges. Danbro provides a portable unit that consists of a drive head with drive tool, an extendable reaction bar to resist the torque, and a hydraulic foot pedal control valve. Danbro offers these portable, hand-held helical pile installation equipment components and provides specialized training to ensure a safe and successful installation. Click here to read a detailed case study on a project with limited access. Are your foundation or basement walls buckled or bowed? Do your doors and windows stick or not open properly? How about cracks in exterior or interior walls? Cracks in your ceiling or foundation? Uneven or buckled interior floors? These are all indications that your foundation is settling. There are many possible reasons for this phenomena. However, the best fix to stop the settlement completely without further recurrence is helical piers with an underpinning bracket secured to the existing grade beam. The bracket is secured underneath the existing foundation. This transfers the load from the foundation to the bracket, down to the helical plates deep in the ground. It effectively transfers the load of the building to deeper bearing strata in the soil, transferring the load to soil that can support the load of the building. Settlement arrested.